People in the Southwest are driving less and using transit more, but transportation spending doesn’t reflect those trends, according to a new report from the Southwestern Energy Efficiency Project. Instead state DOTs are building more roads, as though nothing has changed. Meanwhile regional transportation agencies like the Denver Regional Council of Governments aren’t spending enough on pedestrian, bicycle, and transit projects to keep up with changing attitudes toward driving. The report, Driving Trends and Transportation Funding in the West, covers Colorado, Arizona, Nevada, New Mexico, Utah and Wyoming. It drills down into each state’s largest metropolitan area to conclude that the Southwest’s latest regional transportation plans spend 72 percent of their funding for roadways, pretty much the same amount — 75 percent — they reserved for roads before 2007, when road travel began to drop. Less driving reduces demand for new roadways and lessens wear and tear on existing roads, both of which lead to lower expenditures on roadway infrastructure… In addition, to the extent that reduced [vehicle miles travelled] is connected to changes in urban form and travel behavior that lead to more walking and biking, there are important direct health benefits. So why aren’t transportation planners adjusting their budget allocations to accommodate and support this trend? Public demand for bike lanes, public transit and safe pedestrian routes is growing at the same time that the public is driving less, yet the vast majority of transportation dollars are still earmarked for road construction. Per capita, driving mileage — or vehicle miles traveled — in the Denver area has stagnated or dropped since peaking in 2006, according to the report. The average person drove about 25 miles per day that year, and drove about 24 per day in 2013, the most recent year with data available. Driving mileage per capita hasn’t been this low in the Denver region since 1993. As the number of miles Coloradans drive fell between 2006 and 2013, the number of miles traveled on public transit rose by 30 percent, Salisbury said. And RTD’s regional rail network won’t even be fully operational until next year. Still, there’s more shade than sun in the report. The report calls out CDOT’s insistence on using old projections to rationalize widening I-70 at a cost of $1.8 billion. Despite the decline in total VMT, the number of roadway miles keeps growing, along with the amount of money that could be used for sustainable transportation — and that needs to stop. also, should that be $1.8 billion? Take a look at page 16. I think the confusion is mixing DRCOG area numbers with the state as a whole. Per capita VMT statewide fell by 11.5%. The DRCOG numbers are based on regional estimates by DRCOG; the statewide are based on FHWA numbers, so they use somewhat different methodologies. 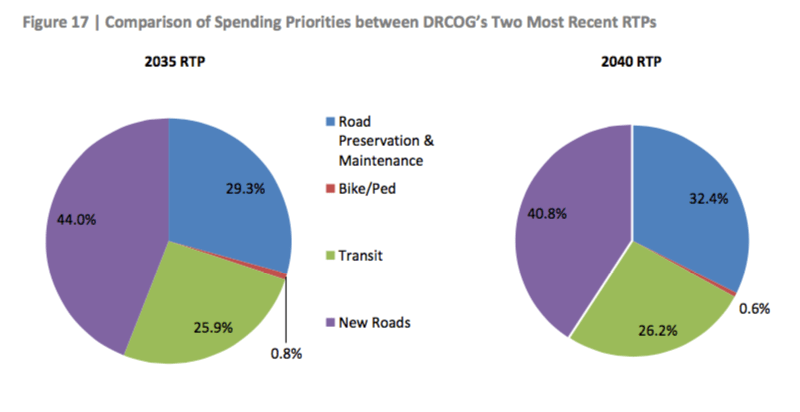 1) DRCOG doesn’t spend, they allocate to local governments. Locals decide what they want to spend federal funding on. This DOESN’T count for local projects with local funding. 2) Figure 17 represents percentages for BILLIONS of dollars over a 30 year period. Note that this is within the RTP, which doesn’t actually allocate anything. The only thing it does is says that a small percentage of capacity projects ARE ALLOWED to be built if they still wish to at some time in the future with federal, state, or local funds. A more accurate comparison would be real and actual allocated funding over time. In addition, almost all roadway projects have a bike/ped compoent, which isn’t mentioned. Hi, TTIP. This is not really accurate. I spent 15 years on the DRCOG board, including a stint as board chair, and was involved in several major updates to the RTP as well as multiple rounds of TIP funding. Locals get to apply, but the allocation decisions are made by the DRCOG board. There are always many more bike/ped projects applied for than get funded, so the issue is not that local governments don’t want these projects. To be fair, DRCOG has been getting more multimodal over time – when I first joined the board in 1997, the only money going to bike/ped was the small amount legally obligated to that purpose; now the board uses flexible pools like CMAQ and STP-Metro. Here is a post on the pretty good job the DRCOG board did in the last TIP: http://www.walkdenver.org/a-step-forward-for-sustainable-transportation-in-metro-denver/. And the RTP numbers are the fiscally constrained RTP, not the vision plan, so they are at least a somewhat meaningful reflection of priorities. I do agree with you about bike/ped components of road projects- if we can get them built as Complete Streets, which sometimes happens and sometimes doesn’t.